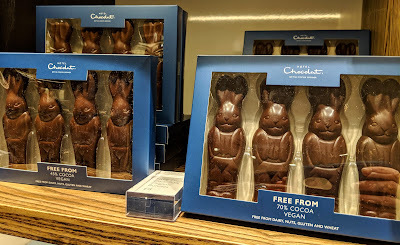 Hotel Chocolat had two free from chocolates in stock the day I visited: a 45% cacao and 70% cacao four-pack of Easter bunnies. The chocolates are totally adorable and at £8 a box, the price is pretty comparable to their non-free from chocolates. 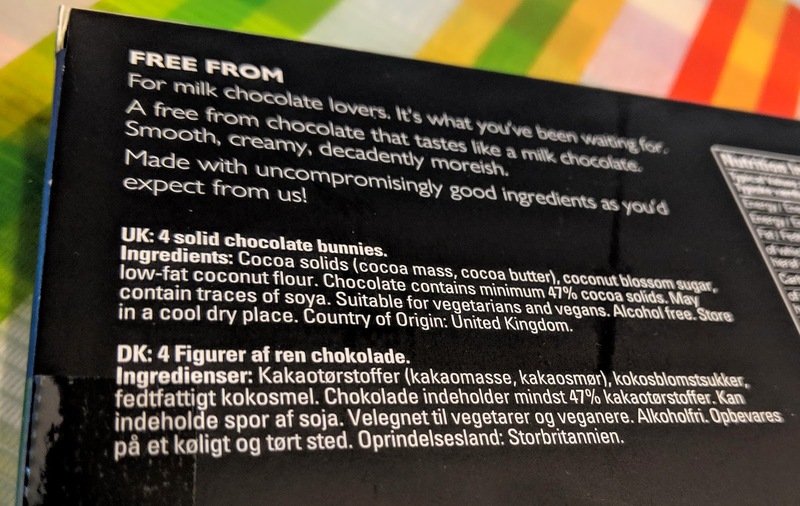 While free from gluten, milk, and nuts (and also vegan), the chocolates may contain traces of soy and the 45% cocoa chocolates have coconut ingredients, so they are not totally free from all allergens. The chocolates are also made in a free from environment so as to ensure their safety from bean to bar. The 70% chocolates (the upper row of bunnies in the picture) are an intense chocolate, with notes of sweetness and bitterness in an perfect proportion for an ideal dark chocolate. The chocolate itself is smooth and melts in your mouth, and is oh, so decadent. 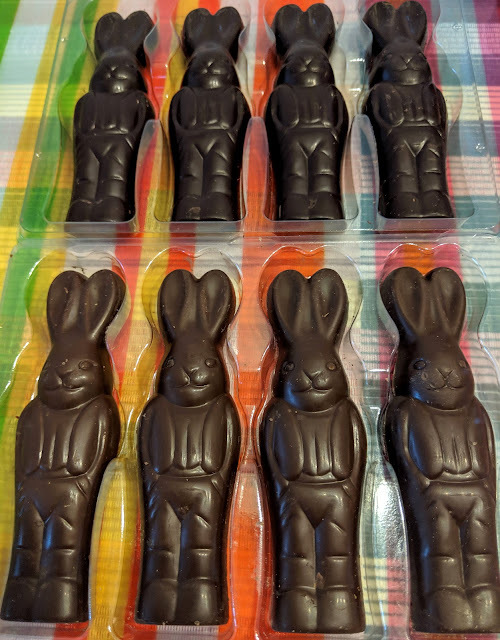 I slowly ate each chocolate bunny bite by bite to savor the intensity the flavor. This chocolate is totally designed to please any dark chocolate lover but also win over those who may not think dark chocolate is for them. The lighter of the two free from chocolates I purchased were the 45% cacao variety. While not exactly a "milk" chocolate because no plant-based milks are used, the lower cacao percentage lends itself to a less intense and sweeter chocolate. Because coconut flour and coconut blossom sugar are used to temper the cacao, the chocolate does have strong notes of coconut. Texture-wise, these chocolates were less creamy than their darker counterparts, and had a slightly chalky consistency, but deliciously melted in my mouth as I ate them. Of the two varieties of free from chocolates I purchased, the dark chocolate totally stole the show. Of course I am a dark chocolate lover by nature, so I am naturally inclined to prefer a higher cacao ratio, but it was texture of the chocolates that made eating it such a luxurious experience. 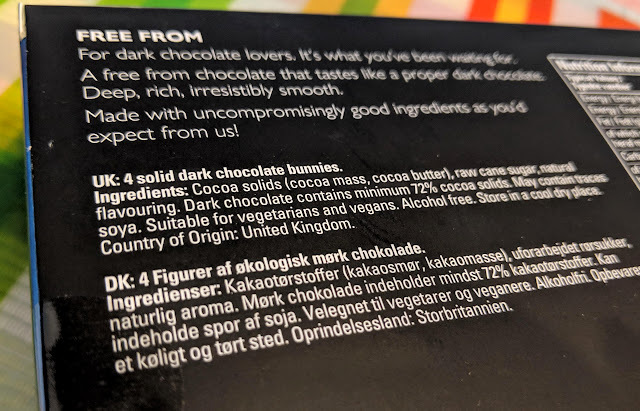 I applaud Hotel Chocolat for their use of quality ingredients (and short ingredient lists) and expert craft in ensuring those of us with dietary restrictions can enjoy the simple pleasure of going into a chocolate shop and being able to purchase a whimsical, yet safe confection. I hope Hotel Chocolat has plans to expand this line, and will definitely plan on making their shops a must-do stop on future trips to the UK. Disclaimer: This review is current to the original publication date. Updates will be noted. Ingredients and manufacturing processes can change without notice. Each product should be reviewed for individual nutritional needs. Feel free to to contact me with any questions or comments. I purchased the product independently and this review is a reflection of my personal opinion.